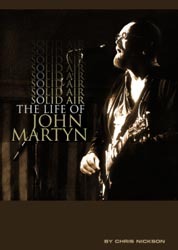 For over four decades, John Martyn was a musician’s musician (lauded by artists as disparate as Eric Clapton, Phil Collins and Bob Marley), a superb guitarist and singer who straddled the worlds of folk, jazz and rock, earning an OBE and being honoured with a Life Achievement by the BBC Radio 2 Folk Awards shortly before his untimely death in 2009. He was a true innovator, constantly pushing the boundaries of his music – but he hadn’t been kind to his body. Drinking and drug use contributed to serious health problems that led to the amputation of part of John’s leg – but even that didn’t slow him down. He turned out one of his best albums in 2007, and toured regularly. There were plans for a new record – but John succumbed to pneumonia early in 2009. He leaves behind a body of work that ranges from the beautifully intimate to the majestic, created during a turbulent, troubled, but uncompromising life – all detailed in Solid Air. Availble as an ebook – buy it here.